Karwa Chauth is a very popular festival among married Hindu women. Though originally celebrated by the Indian woman in the northern and western parts of India, it is now celebrated widely due to its spiritual piety. It is the toughest fast but despite that married women do this to wish long life, well being and prosperity of their husbands. If the couple is newly wed, then there is great pomp and enthusiasm in the celebration. If you have Karva Chauth festival being celebrated in your family, then you can use Yoovite.com to invite your relatives and friends since it has a unique online invitation tool. This festival is about Indian women and their struggle in life and is welcomed with great fervor. In addition to the happiness it brings by blessing their husbands with long life, Karwa Chauth also gives the pleasure and happiness of receiving beautiful gifts from their husbands and relatives. Since the fast is tough, the husbands out of love bring heavy gifts for their wives. The woman’s relatives also gift her with jewelry, bangles, henna, sarees, lehnga choli etc. The most popular gifts given to women on this day are 'Sargi' and 'Baya'. Sargi is the gift of scrumptious meals, sweets and clothes given to the woman on Karvachauth. Baya is also a similar gift package. Both are extravagant and royal and considered precious. There are many options for you to choose gifts for your wife during Karwachauth. Many varieties of designer sarees are available in shopping malls that can lure your wife’s interest. You can take her along so that you can buy something that she would love the most. A tour to a beautiful place is another gift that you can give her. Take her to a romantic place where you can dedicate all your time for her without having to worry about your office work. This will be very refreshing for your relationship. Yet another option is expensive jewelry. Gifting a classic jewelry set that will enhance her beauty would be an ideal option. If she loves antique jewelry, then you can get that too. 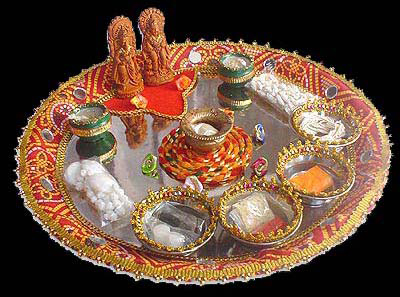 The decorated thali is a very important component in Karva Chauth puja. The thali also known as Baya contains roli, vermilion, sacred water, dry fruits like almonds, pishta etc., earthen clay pots, diyas and different types of Indian sweets in their respective tumblers. It may also contain the ritualistic decoration like rangoli and alpana. Goddess Parvathy is worshipped on this day. Special pujas are conducted in her favor on this day. There are several great recipes that you can prepare on this day of Karwa Chauth. It is all vegetarian ranging from sweets to great dinner and lunch dishes. Rabdi is a good dish made out of condensed milk and bread. You can also prepare Dum Aloo, Aloo Tikki, Badam Puri, Broken Wheat Kheer etc.